I got into barefoot shoes when I started yoga. No coincidence. I became aware right from the start how weak my feet were. Weird, hadn’t I been walking on them all my life? 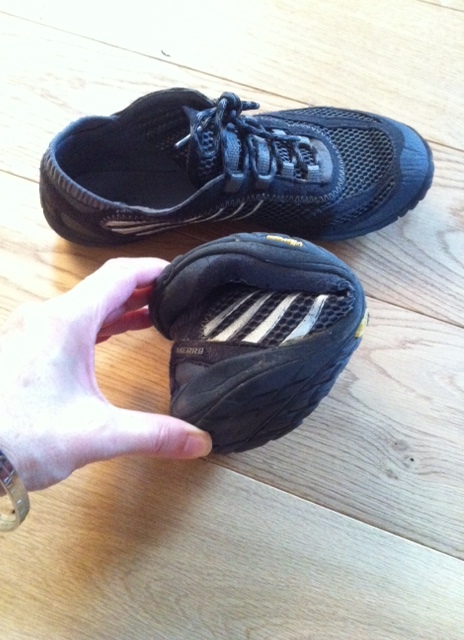 But that, plus rigid shoes, don’t make for strong feet it turns out. So I got a pair of Zem shoes which wore out disappointingly quickly, and since then I’ve turned to Vivobarefoot (who even do some ‘office style’ shoes for the non-yoga parts of my life) and Merrell. The idea is that walking barefoot (or the near enough modern-life city-dweller equivalent) is great for your posture and helps to strengthen the muscles of ankle and foot, as well as a whole host of benefits I’d not heard of before. I know the jury’s out on the benefits of actually running barefoot, and I have to say that idea scares me quite a bit. But for walking I really like greater sensitivity of a barefoot experience and the awareness it brings to what I’m doing and what my environment is like (far from a walking meditation, but at least I’m more mindful with-a-small-m). It can be tough if you’re walking a lot on pavements, but I guess that’s just a reminder to take some breaks and get off your feet for a while. Or do some yoga later and include some lovely stretches to arches and ankles. Plus my husband offers (or sometimes is required to offer!) the most delicious footrubs. Lucky me! A seated spinal twist doesn’t work if you don’t push your foot into the ground, since it’s joined ultimately to the hip that you twist towards, and a firm foot helps stop that hip moving backwards which puts the twist too low in the spine. And in baddha konasana I’ve found it really helps if you can open your feet out well (like a book) before you fold forward, and that pressing the outer edges of the feet together somehow magically helps to release the hips and let the knees sink down more. Plus I’m learning that how you bear weight on your feet is also important. Lifting my arches still feels as impossible as asking me to wiggle my ears, but I think one day it won’t. For now I’m mostly just playing around more with weight distribution on my feet in various poses. 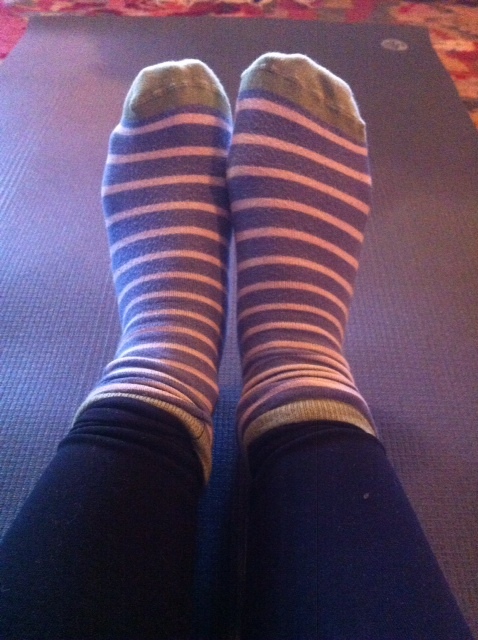 And although I love what my feet can do, I still don’t think they’re my finest feature, so here’s pic of them cosseted in stripy socks — which for me are a sine qua non of savasana at home! Feet are so important! It is weird but yoga always gives me an intense appreciation for my feet! I think it is partially because I spend a lot of time looking at them during my practice, and so the peace and acceptance I feel during my practice gets projected onto my lil tootsies and I feel so grateful for how much they do for me! So amazing that they are so tiny and yet they hold up our whole body. Very cool to hear about your barefoot walking, Ive never tried barefoot shoes but summer in NZ it is my mission to be barefoot 90% of the time, especially at my family home in the green nz countryside. Yeah and I feel quite similar about my hands too. Ok so they carry less weight in my yoga practice (I’m not a handstand practicer!!) but I sometimes feel like they’re energy conductors stretching away from my body in poses like vira2 or pointing up to the sky in trikonasana. I love your expression about projecting feelings of peace onto your feet. Barefoot shoes at the best I can do living in a dirty UK city, but the greenery of god’s own country sounds sublime — and your feet’ll love it!